Hezbollah leader Sheikh Hassan Nasrallah has given a defiant speech in which he said his guerrillas would turn south Lebanon into a graveyard for the invading Israeli troops. There were no surprises in the speech, broadcast on Hezbollah's al-Manar television on Wednesday. Like previous speeches since the conflict began nearly a month ago, the aim was to boost morale, rally support and challenge the Israelis. it came only hours after the Israelis announced that their army would expand its ground offensive. 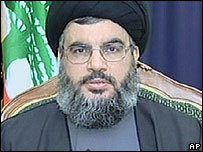 Sheikh Nasrallah spoke calmly and confidently, as the confrontation with Israel was about to enter a critical stage. The televised address was clearly designed to send a message to the Israelis and the wider world - namely that Hezbollah remained a coherent, strong and unbroken organisation. He urged the Lebanese to remain steadfast and united in the battle against Israel, and warned the Lebanese government against making any concessions to Israel and America. He endorsed a government plan to send 15,000 Lebanese soldiers to the south. But he repeated his opposition to the idea of sending international troops to the border region to disarm Hezbollah, as demanded by the Israelis and by a draft UN resolution sponsored by the French and the Americans. He said the aim behind the UN resolution was to enable Israel to achieve by diplomatic means what it had failed to achieve on the battlefield. Sheikh Nasrallah said his guerrillas were still strong and ready to take on the Israeli army when it pushed deeper into Lebanon.